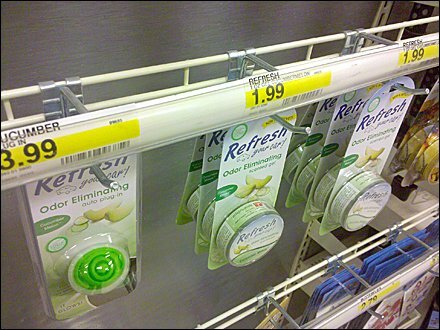 Extruded Label Holder Strip run across rows of Display Hooks is a distinctive concept not used often enough. And here is a perfect application. Linear 1″ Wire Grid creates a Bar Merchandiser. Clip-on Scan Hooks can mount anywhere along the Bar to suit the merchandising need, yet resist being jostled out of position far better than saddle mounts. Because merchandise size and hook location can vary along the Bar, it is completely logical to use an extruded strip as Label Holder System. It allows flexible label placement, as well as reinforces the linear layout. CLICK the thumbnail for a closeup of the hook. 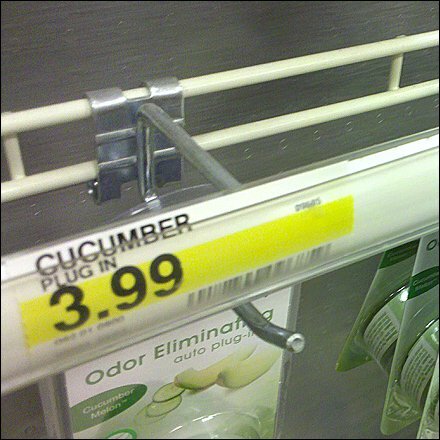 For high-tech at the shelf edge SEE….